Chinese people waste a whopping $32.6 billion worth of food every year which could potentially feed 200 million people, while 35 billion kgs of grain are squandered annually in storage and transportation, an official has said. Citing expert estimates Wu Zidan, deputy director of China's State Administration of Grain, said the impact of excessive food consumption is being felt on China's scarce water and farm resources as almost 200 billion yuan worth of food is discarded from dining tables every year. The wasted food could potentially feed more than 200 million people, Zidan said yesterday at a ceremony kicking off a one-week long education event aimed at raising people's awareness for saving food. Zidan made these revelations amidst an austerity campaign launched by President Xi Jinping since early this year mandating hotels and restaurants to ensure food is not wasted. Some experts even blame the wastage on an age old Chinese custom that people should leave some food offered by their hosts as a show of respect for them, as emptying the dishes may mean that food has run out. In addition to the wasted food, roughly 35 billion kilograms of grain is wasted each year in storage, transportation and processing, Zidan was quoted as saying by the state-run Xinhua news agency. The wastage of such enormous amount of grain is a surprise given that Chinese grain storage system is believed to be so efficient that a number of Indian officials have visited the country's grain silos in the past to study the storage methods in order to minimise wastage. With world's largest population of nearly 1.4 billion people, food security remains a major issue in China. Rising pollution, limited land and water resources and ever increasing demand of land for industry and urban projects have further increased the strain on agriculture in China, which is already one of the world's most heavily farmed countries. 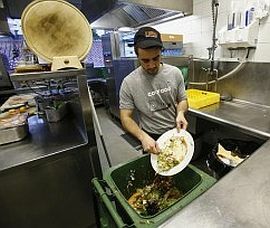 Image: A cook throws away leftover food in a restaurant. Human Development Index? India's rank a poor 135!